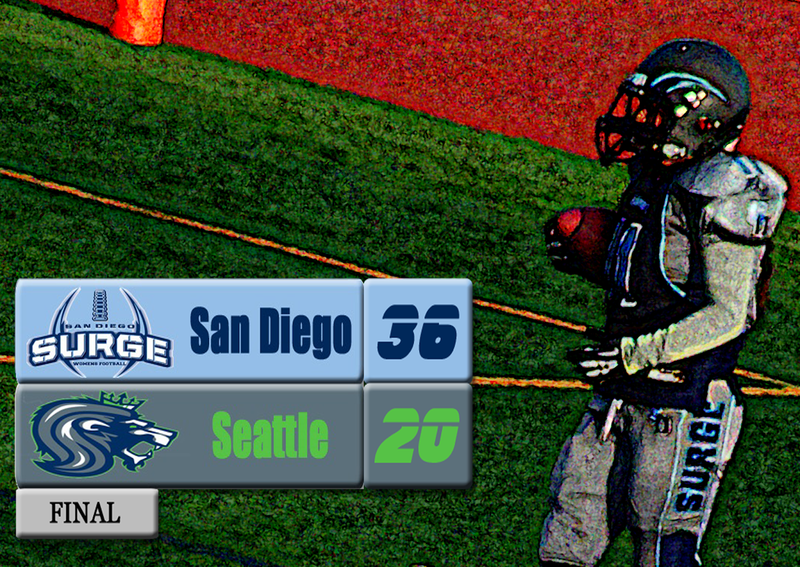 KENT, WA (07/05/2014) For the second consecutive playoff game, the Surge found themselves in a first half dogfight. Trailing 20-16, a halftime adjustment was needed and the team came through again. The Surge rallied back with 20 unanswered points in the second half to escape with the win and take another step towards the national title. With the win, the Surge moves on to the WFA American Conference Championship, where they'll host the Kansas City Titans (10-0) on July 19th. The Titans are coming off a 41-0 win over the Austin Outlaws. Seattle got on the board first with a 19-yard touchdown pass from quarterback Rachel Gore to Adrienne Wilson. The Surge answered back on their next possession with a 44-yard drive that ended with a two-yard touchdown run by Jordain Sablan to tie it 7-7 with 8:02 left in the first quarter. Following an interception, the Surge ended another long drive with a one-yard run by Knengi Martin to take a 14-7 lead into the second quarter. After holding the Surge on 4th and 1, the Majestics scored off a 31-yard touchdown pass to tie the game 14-14 with 7:05 left in the half. On the ensuing possession, Melissa Gallegos' pass was intercepted by linebacker Toakase Tukutau and returned to the Surge five-yard line. Gore found receiver Jamie Fornel for a five-yard touchdown pass to give the Majestics a 20-14 lead. During the PAT, Surge defensive back Ashley Moody retuned a blocked kick to the end zone for two points, cutting the Majestics' lead to 20-16 going into halftime. The winner of the American Conference Championship will face the Boston Militia or Chicago Force in the WFA National Championship game in Chicago on Saturday, August 2nd.